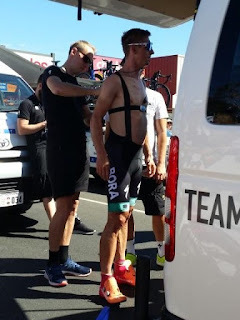 Lupey Loops: Tour Down Under 2019 Pictures and Giveaway! Hot, hot, HOT! 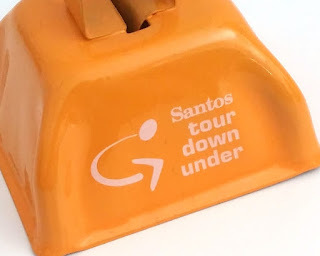 The only way to describe the 2019 Tour Down Under. but I did get down to McLaren Vale–again–where it is always a few degrees cooler and where the exciting final stage and punishing Willunga Hill would determine the overall tour winner. Before you think you will be bored with more photos from McLaren Vale, think again. This year I bring you different behind-the-scenes pictures of things you do not always get to see on the television broadcasts. (in more ways than one)! I'm also excited to conduct Lupey Loops' very first giveaway! Are you in? If it proves to be popular, there might be more giveaways in future. This year, I was on a mission. Let's just say, "I got what I came for!" It was lovely just to stroll down the main street and enjoy the atmosphere, full of smiles, activity and anticipation. These sunflowers were being sold to raise funds for the McLaren Vale & Districts War Memorial Hospital. That's Hon Leon Bignell MP for Mawson, holding up the donation bucket with a big smile. 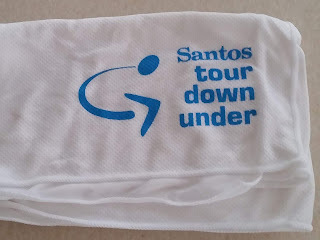 The 2019 Tour Down Under is the first one without former cyclist and commentator Paul Sherwen who passed away suddenly on 2 December 2018. As discussed in the previous blog entry, there's a lot of love for Paul Sherwen and Phil Liggett in South Australia. 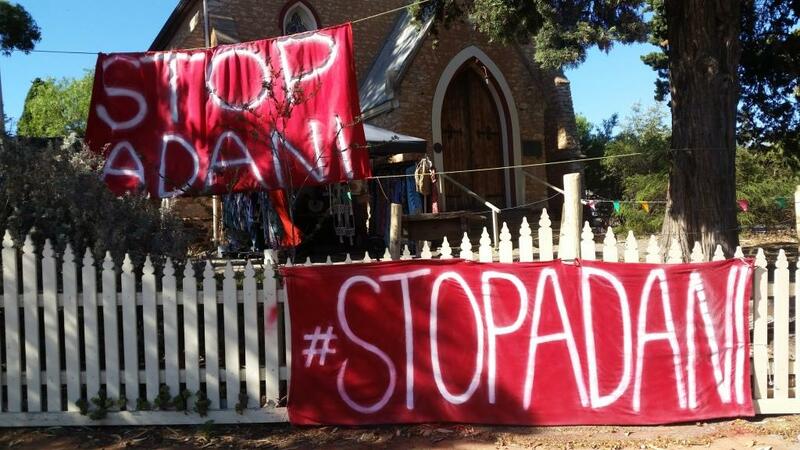 They were frequent visitors to the McLaren Vale area and won the hearts of locals who are feeling the loss. An early morning tour group experiencing parts of the course before the race. There are many tour groups for cycling enthusiasts. 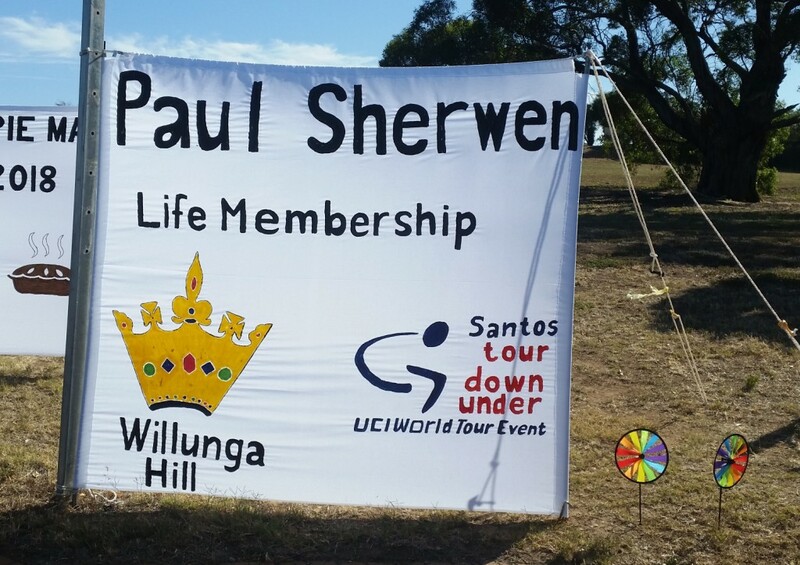 Locals decorated the corner of Tatachilla Road and Caffrey Street with tribute banners for Paul Sherwen. 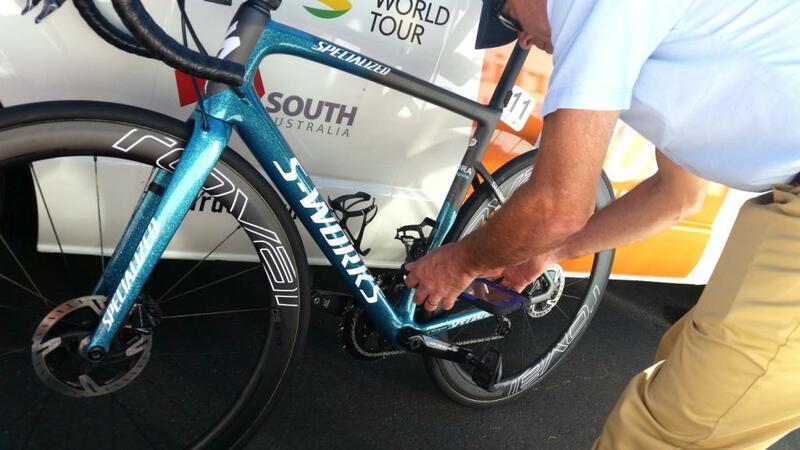 "Paul Sherwen. Life Membership. 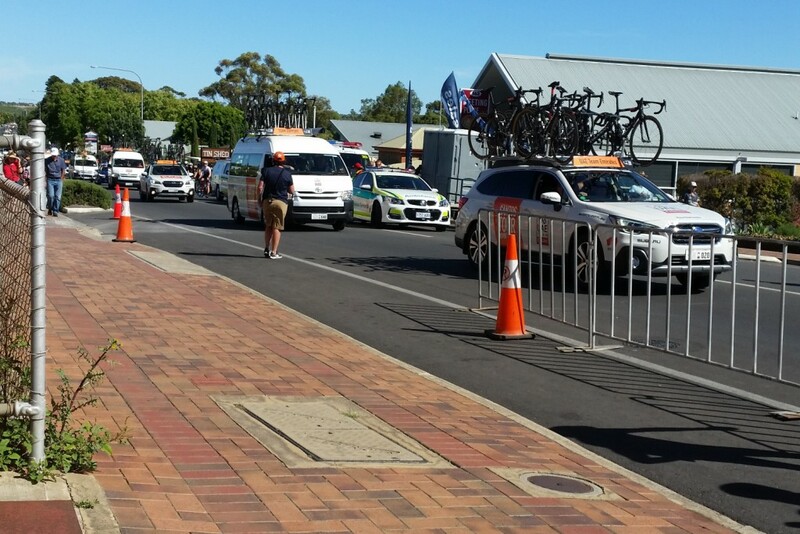 Willunga Hill." also on the corner of Tatachilla Road and Caffrey Street, McLaren Vale. 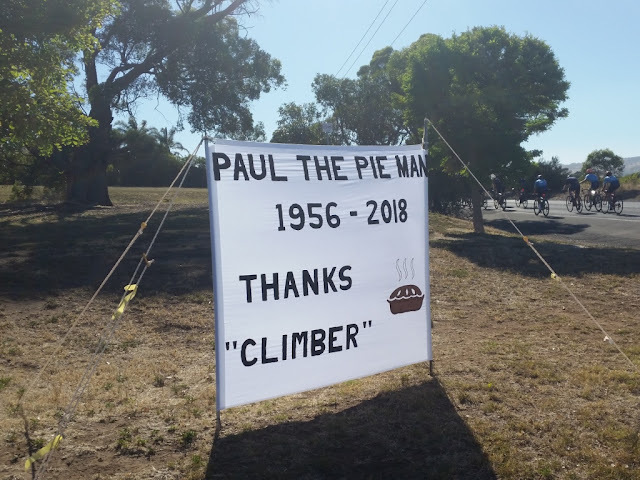 "Paul the Pie Man 1956–2018. Thanks "Climber" "
Some people used the event as an opportunity to protest. 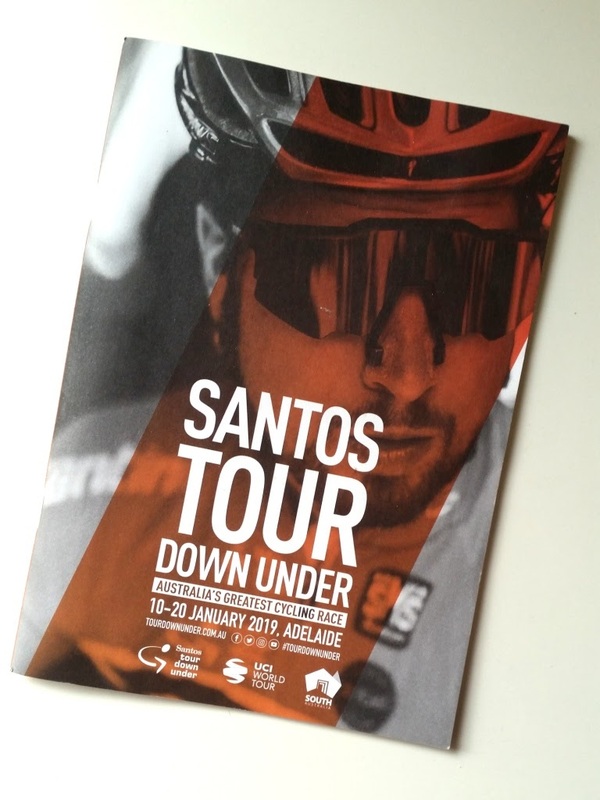 The Tour Down Under teams arrive! We had a great view of pre-race activities as the team buses rolled in, jam-packed with gear–bikes, toolboxes, picnic boxes, first aid kits and racks of helmets and whatever else I'll never know. All I do know is that some of those buses, when they opened their tailgates, had not an inch of space to spare. 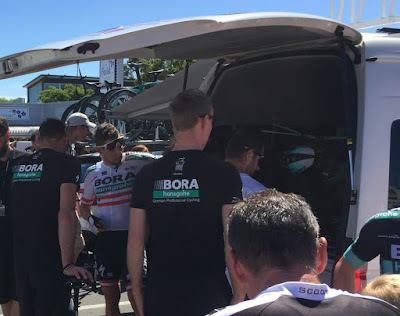 All the team buses are the same except for one–the bus of the Bora-Hansgrohe team–which arrived with dark tinted windows so no one could see inside. 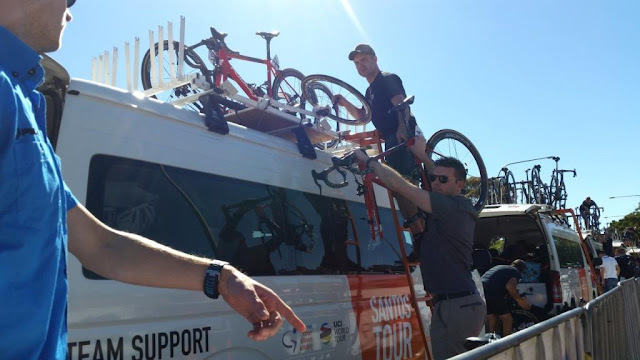 This bus carried one of the biggest celebrities in world cycling, the World Champion Slovakian rider, Peter Sagan. He has been a huge favourite of fans, especially female fans! 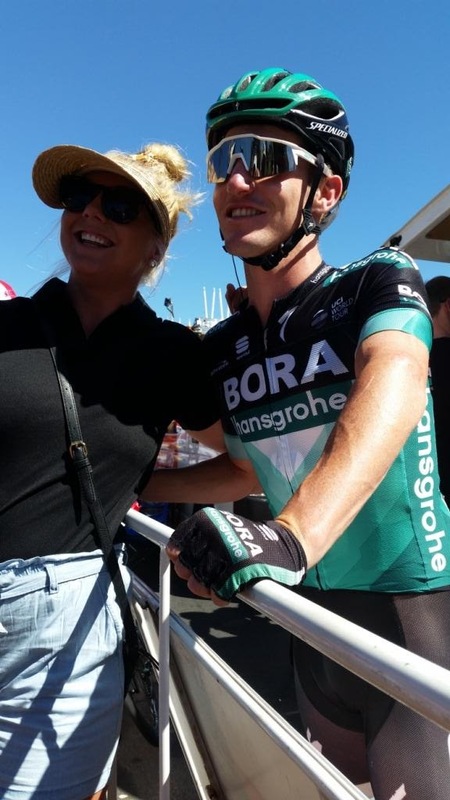 He's a bit of a 'rockstar' on the cycling circuit. 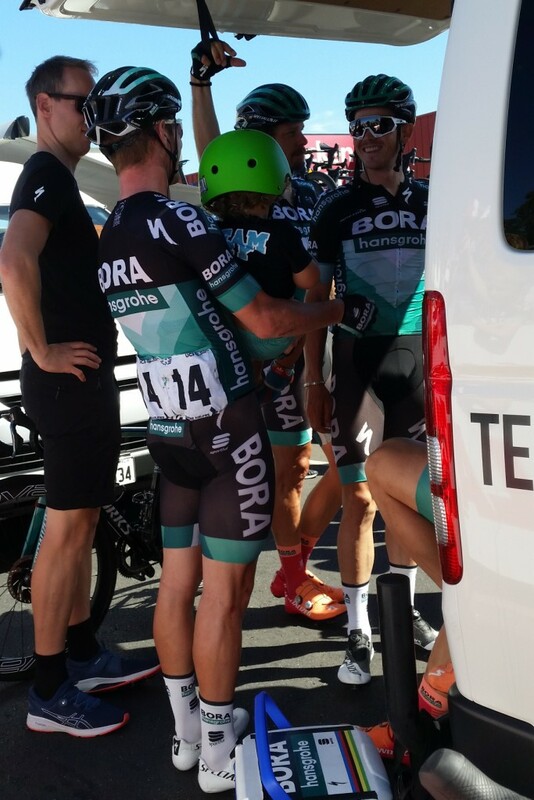 as team-mate Daniel Oss looks on. He is a most extraordinary rider. His skills are remarkable. That comes from a background of mountain and off-road biking. He exudes natural talent and the things he can do on a bike leave me, a former commuter road cyclist, in awe. Anyone could be forgiven for thinking that he was born attached to a bike–he's like a gymnast with wheels. for the German Bora-Hansgrohe team. This year, I got to tell him in person! While he has probably heard plenty of the same compliments over and over, he was very gracious and friendly and gave his full attention despite a crowd of people all clamoring for the same. There was a lady next to me who had travelled across the country from interstate to try and meet him. She was clutching his recently published autobiography and he kindly signed it for her and also had a few words. 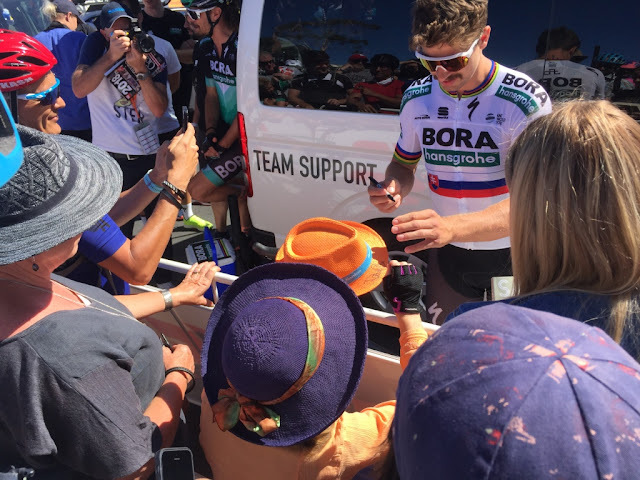 Thank you Peter Sagan from happy fans! 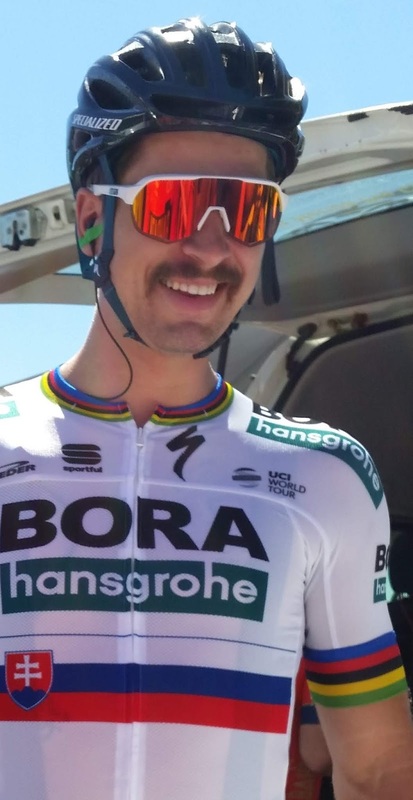 Peter Sagan's team-mate and right-hand man, Daniel Oss, is another rider that I hoped to meet. 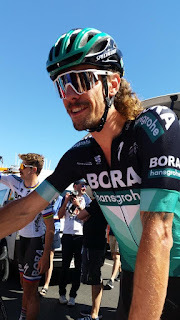 He is a very aggressive rider in the races and friendly with the public but he appeared almost shy as he sat in the background while Peter Sagan did his thing with the fans. Everybody's preparation is different. Daniel Oss is waiting quietly at the back of the bus with the dark tinted windows. Meanwhile photographers, amateur and professional, snap away! 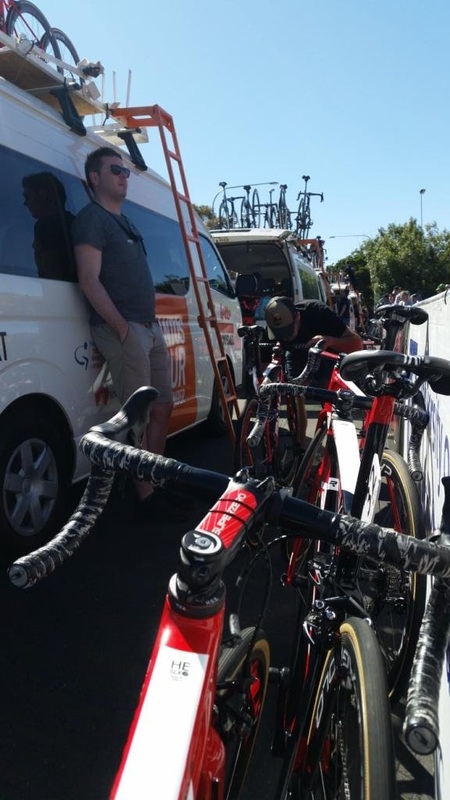 Austrian rider Gregor Mühlberger (#15) waits on his bike. Another rider chats to friends in the foreground. One of the remarkable aspects of the Tour Down Under is that it is a totally portable event. The teams and organisers bring everything they need on the day and within hours of the event finish, it is all packed up and gone. You would never know there had been a world-class international sporting event earlier in the day. The only indications in McLaren Vale the night before, were orange traffic cones along the main street preventing parking along the kerb where the race barriers etc. will be needed. First job on arrival: unpack and assemble bikes! 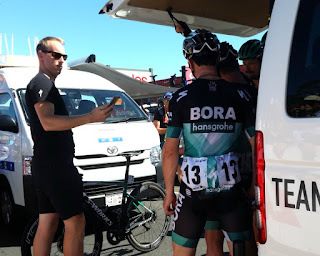 to communicate with the team car during the race. 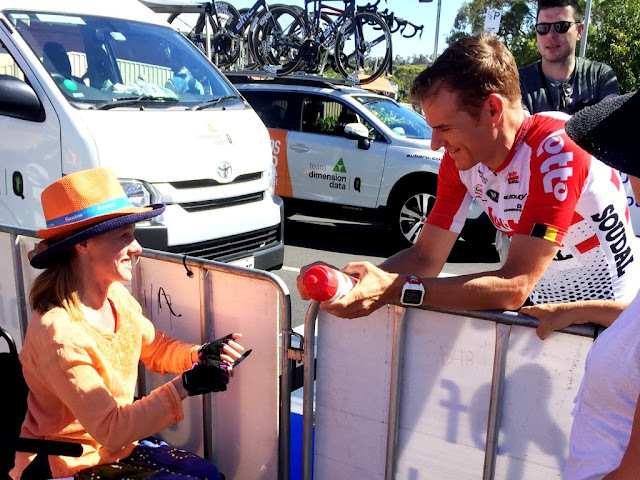 Norwegian Carl Fredrik Hagen from Team Lotto Soudal is doing the right thing. Many people have been seriously sunburnt because they underestimated the power of the Australian sun. some mesh cycling guernseys are no match for the sun. 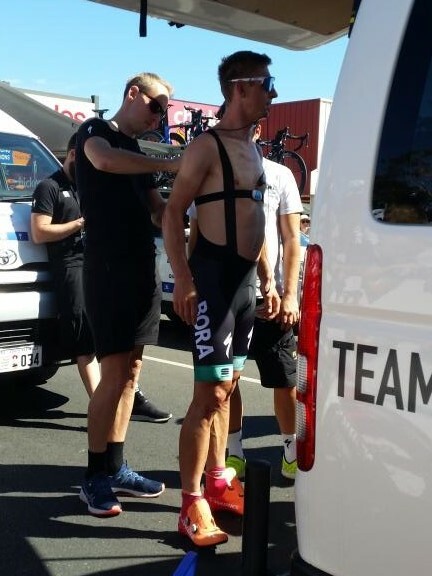 They might be designed for cooling but not sun protection. In Australia, one needs both. If you don't believe me, see Louie Meintjes here on Facebook or here on Twitter. 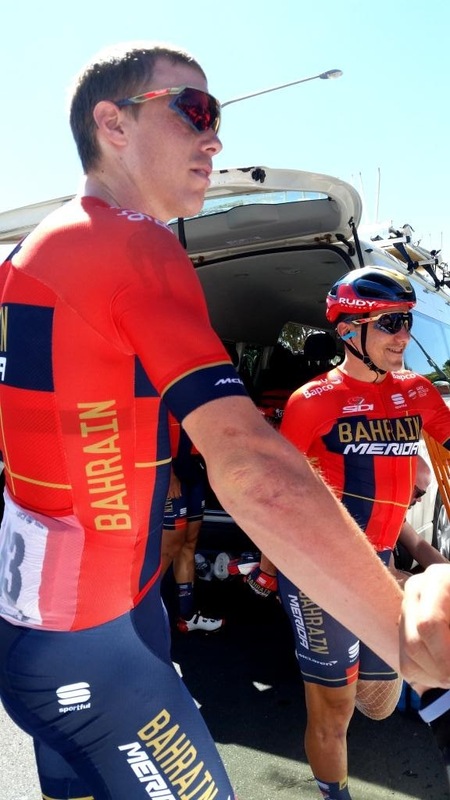 Domenico Pozzovivo (Italy, #66) of the Bahrein-Merida performs stretches before the race. 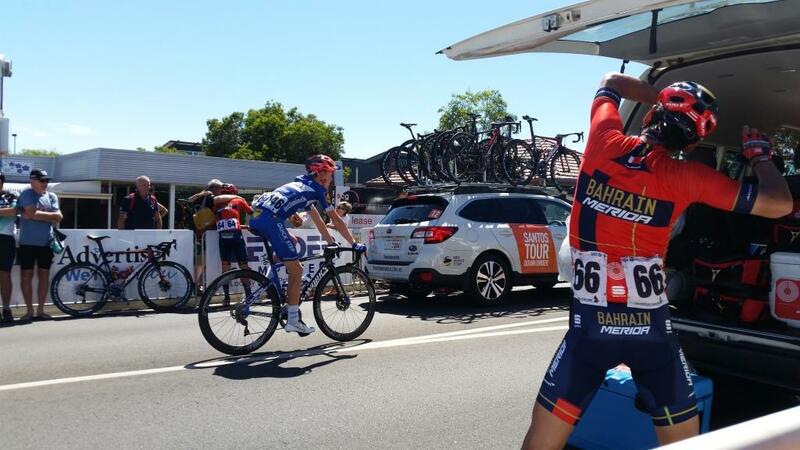 Team-mate Heinrich Haussler (Australia, #64) takes 'selfies' with fans. Meanwhile James Knox (Great Britain, #146) of Deceuninck-Quickstep rides by on the way to the starting line. This is Peter Sagan's bike being scanned by the Technical Commissaire. and that there are no cheating devices like hidden motors etc. So much activity! 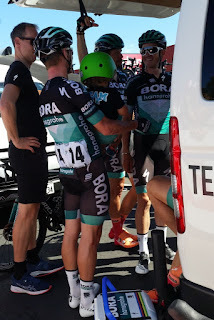 Assembling and tuning bikes, checking gear, race registration, media interviews and public relations, heart monitors and radio packs, helmets, shoes, warm-ups, team meetings and, if there's time, a chance for social catch-up! Riders from different teams get to mingle and chat. Local riders, many of whom are based overseas now, get to see family and friends. One of them was Jay McCarthy who has his own local fan club! … plus a commemorative photo. 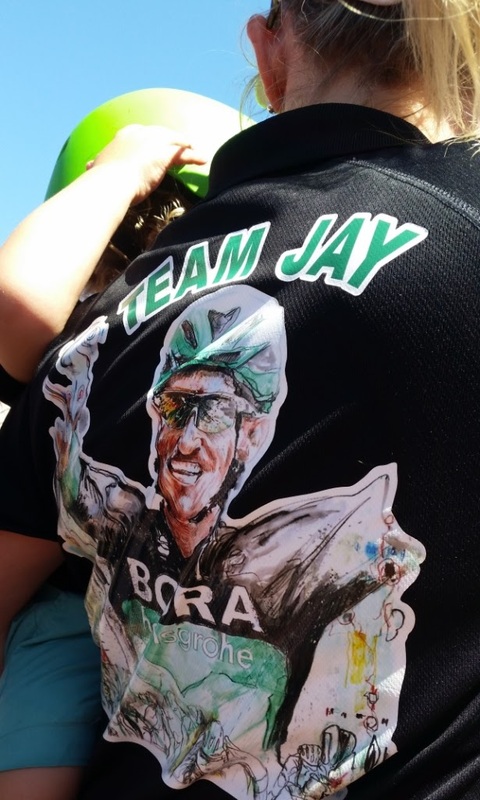 See the result posted on Jay McCarthy's Instagram account. chat to fans and friends on the sidelines. 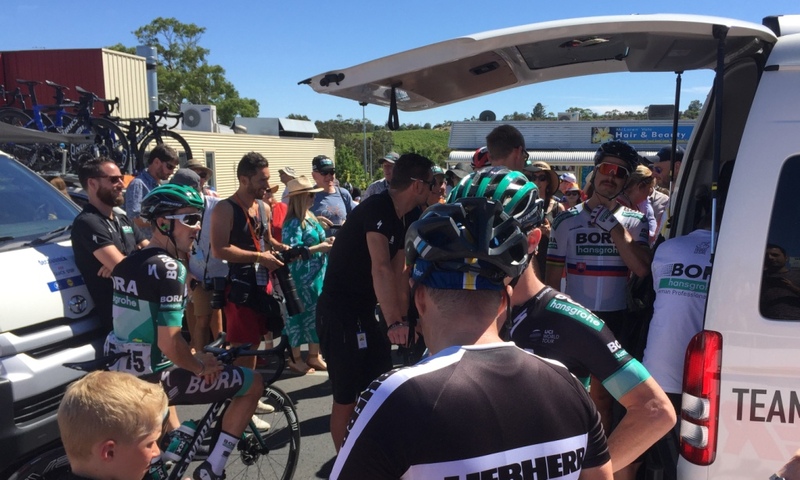 Every year the Tour Down Under has provided tours for all sorts of groups who seek to get 'up close and personal' with the riders and behind-the-scenes access. Of course, these are available for a higher price. 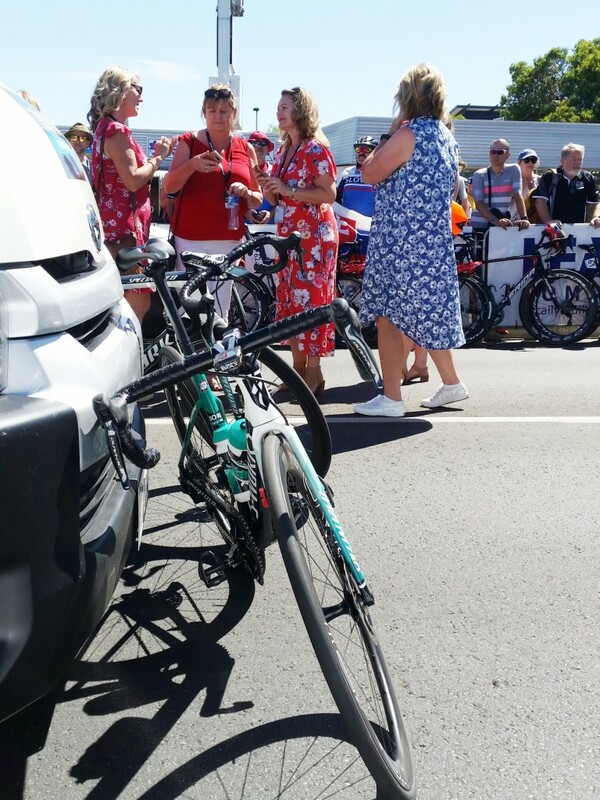 Every time I have come to McLaren Vale, there has been a chaperoned "Ladies' Day" type of group. They have special seating reserved for them so they don't miss any views and always accompanied by a glass of sparkling wine! 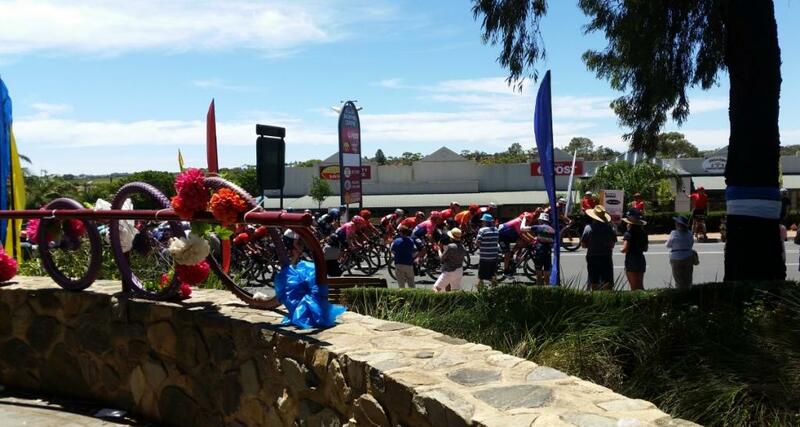 How appropriate for a race in a wine region like McLaren Vale or the Barossa Valley. This type of experience would be a great introduction to the world of cycling for those who haven't been before and want to soak in the atmosphere of the event or for those who are familiar with cycling and want a little more from their race day experience. 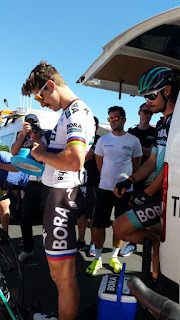 I had a great race day experience because I managed to get the autographs I wanted! who kindly autographed my souvenir bidon. 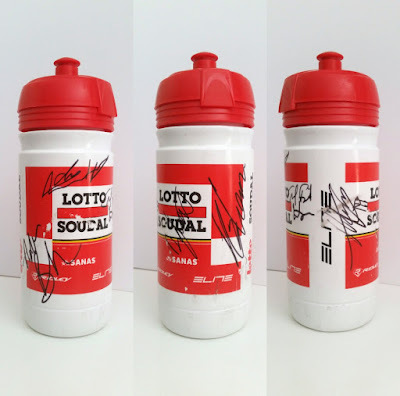 This Lotto Soudal bidon is from an earlier Tour Down Under. Tour Down Under hats come in two colours this year: orange with blue band or blue with orange band. I chose orange because it is one of my favourite colours. 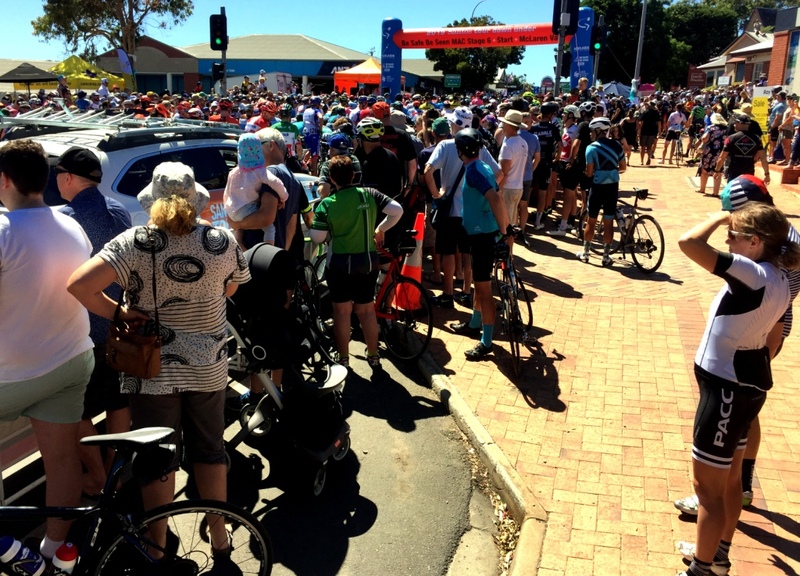 Crowds gather for the starting line countdown: "… three … two … one … GO!" 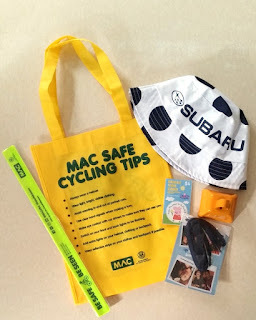 Back in 2017, I shared photographs of the Tour Down Under Parade (Tour Down Under 2017 at Marvellous McLaren Vale, 3 Feb 2017) and of some of the goodies given away by race sponsors. This year, I collected a few things with you in mind so I can share them physically and not just photographically! 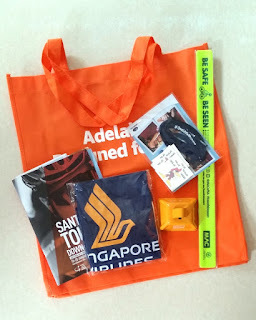 I've put together two little souvenir goodie bags to give away right here on the Lupey Loops blog. 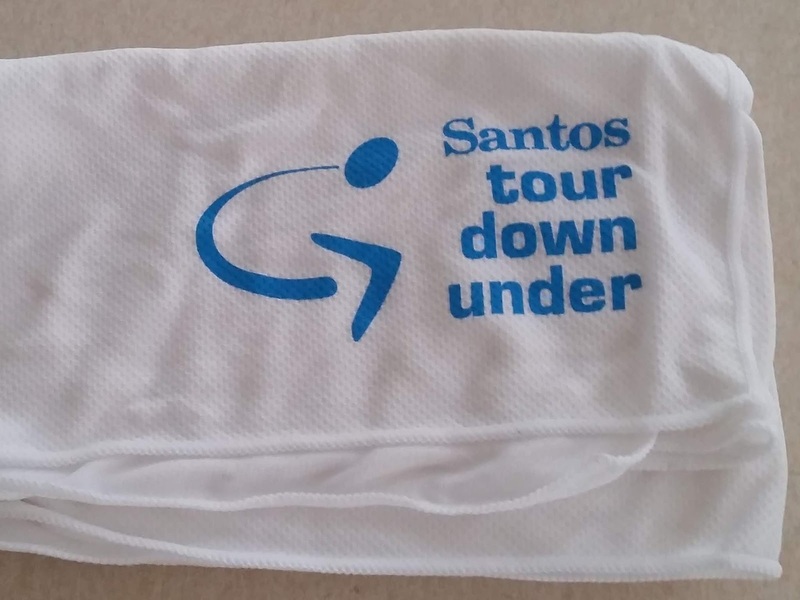 It doesn't matter where in the world you are, if you would like a chance to receive one of these, please leave a comment below before midnight, 28 February 2019 (Australian Central Daylight Savings Time +10 hrs 30 mins GMT). Early in March I will put all the names in a hat and the first two drawn will be the recipients. Only one entry per person please. The results will be posted in a comment at the end of this blog entry. If time and energy permits, There might also be a separate announcement in a new blog post as well. 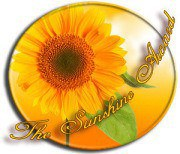 Feel free to leave your email address in your comment so that I can notify you directly should your name be drawn. Be sure to check back to see the results. 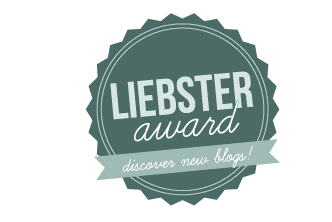 I am very lucky to have a loyal readership and to have made such lovely friends through blogging. This is my way of giving back to everyone who supports Lupey Loops and a bit of fun for all of us. So comment away, my friends! 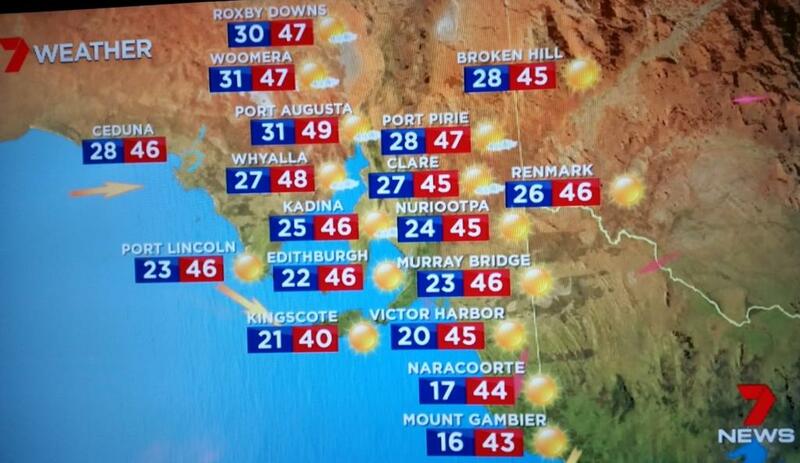 January usually sees temperatures in the high 20s to mid 30s (degrees Celsius). Overnight temperatures are usually around 16 degrees. The heat used to build up slowly over the course of 7-10 days to around 38 (occasionally getting to 42) and then a change would come through and it would cool down and start building again. In the last 5 years though, we have seen less of a build up and more heatwaves of 4-8 days of temperatures over 38 and often a series of days in the 40s. In between the extreme heat, we are getting milder days - no build up to heat but just sudden jumps. Mind you, after this year, our definitions of 'mild' are changing! We were all relieved to have a forecast of 36 degrees although years ago, school used to close early if the forecast temperature was 35 degrees or over so children could get home out of the heat. These days, if we kept that policy, so much school would be missed. Thank goodness for air conditioners and we pray for no power outages. Als je mij wilt emailen, alstublieft naar jodiebodiecrochets@gmail.com sturen. Hiep hiep hoera! I have seen and react. What an amazing experience. 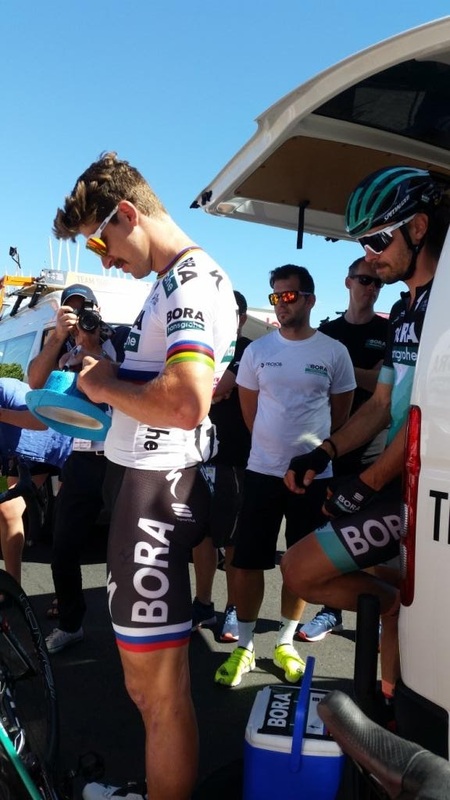 I was see interested to see the behind-the-scene photos, especially Peter Sagan. How wonderful that you got to meet him, he is not just a fantastic champion, he comes across as quite a character as well. I enjoyed your pretty photos on your blog of the French Alps very much with the village bunting and cycling-themed decorations. Have you ever been to the Tour de France or other bike races? Do you ride? As for Peter Sagan, after signing autographs he went off to socialise with riders from other teams. He seems to be well liked and respected by his peers as much as the fans. The Australian race is very laid back though so perhaps we see the best of all the riders while they are still relaxed, still coming out of holiday mode. Amalia, the odds are in your favour for winning a goodie bag. 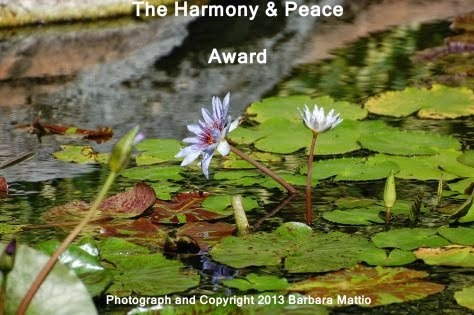 It will be a pleasure to send one to you. I will contact you by email this week to organise the details.